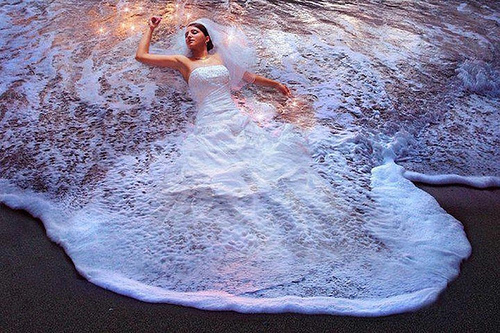 She uses Surf for all her whites. Norma's boyfriend finally took her up the Isle. Jane decided to take the plunge. Morning darling. Are you a wake? "I wish there was a groyne nearby." Flo's enthusiasm to get married was rapidly ebbing. "are you shore about this?" "Just tragic...and on her wedding day, where was she from?" Watch out for the under toe. "...and the marriage was liberally toasted with Asti Spume-ante." A traditional purification ritual for brides who take seamen. "Yeeeeeeah, about the wedding cake. There was...an extra ingredient." "Jane, do you need the toilet before the ceremony?" The bridesmaids in candyfloss photo was just as spectacular. Due to her having her mobile phone with her there was to be no reception. Despite the wedding, it was a strictly planktonic relationship. Her dress is from Coast. The poor girl was jilted at the altar. All efforts to save her were to no aveil. I can see the foam, and the sparkle. But why is there no bouquet? The results of pier pressure. It's not often you see white horses on a bridal path. She was the Mermaid Of Honour.